My nearly 80 year old grandmother has been saying for years that she's too old/tired/etc to knit anymore. She can't see very well, requires hearing aids, and generally doesn't feel all that well most of the time. every project she completes, she comments that she thinks it will be the last doily/embroidered pillowcase/socks that she makes. Well my Mother and I have been pulling the wool over her eyes for a while now. she runs out of yarn - and we buy some more. She comments again that it's too much work. and I drop by with a newly finished project and some skeins of wool to be wound into balls. She has something almost finished (aka. 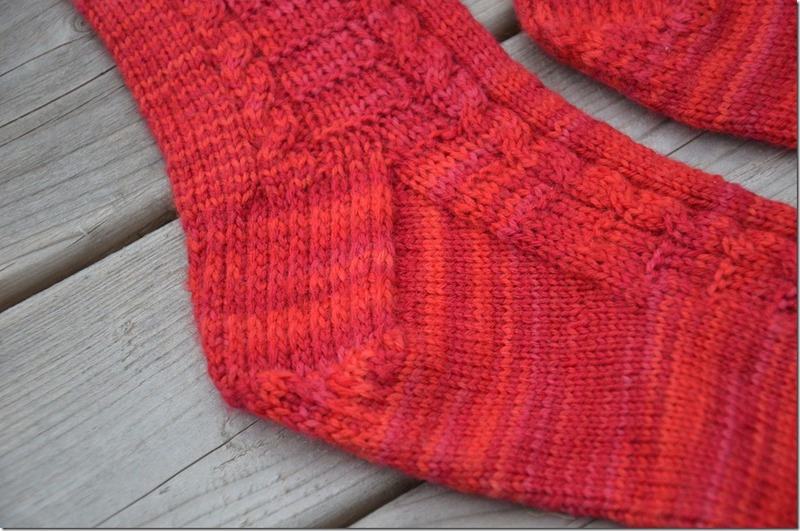 just the last toe on a pair of socks left) and my Mom will drop off some extra pretty yarn in just the right color. Invariably, a few days later she will have cast on another project, and will keep on picking away at it She just needs a little encouragement along the way. One such knit-trickery scheme involved my Mom bringing Grandma some bright red (Grandma's favorite color) tonal-style yarn over one day. 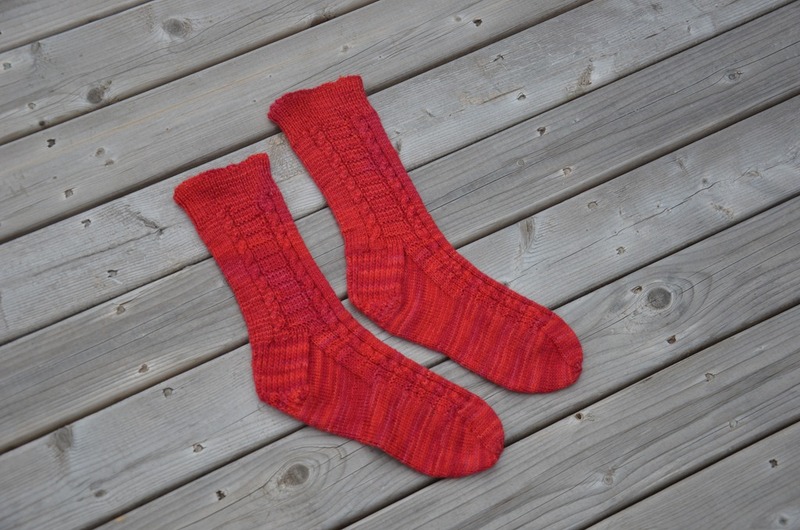 In the past, Grandma always knit the same pair of cabled rib socks (a-la-old-patons-beehive-leaflet) for my Grampa over and over again. They were always blue or grey or brown. Manly colors. Always in Kroy or old-school wool. This red yarn was the exact opposite of the usual cool boring muted tones - it was soft, squishy, warm rosy reds and plums. Grandma wasn`t too sure anyone would wear socks made from such a bright color. I assured her that I wear socks of every color. the brighter the better in fact. I see them like a beacon of happy color, hidden in shoes during the day, but peeking out over the tops like a not-so-well-kept secret. She agreed that if I would wear the socks. she would like to try knitting with that yarn. So that was that. Now the socks are done! What do you think? I think they look charming and cheery in red! And there is just enough yarn left for a little pair for the littlest beetle too. 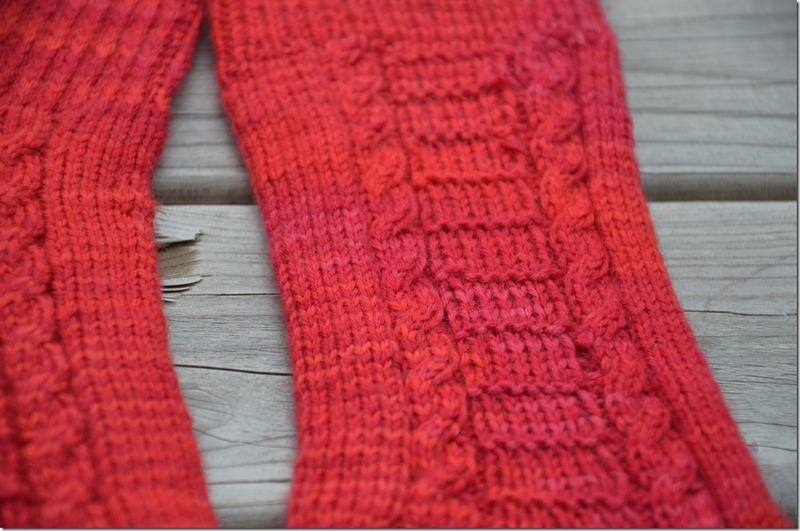 My plan is to knit up a pair that will fit the Rome-ster and we can wear our matching set when we visit Grams again. I bet that will keep her inspired for a little while longer?